Samples of your product must encompass and support the unique story of your brand. Showcase your line best with our effective custom sampling tools proven to generate consumer appeal. Swatch Cards are a convenient and cost effective way to present your fabric samples to your clients. A Swatch Card allows a user to see exact colors and get a feel of the fabric while displaying a wide selection of styles and colors. Swatch Cards can be placed within a binder or stand alone. Typically, we produce Swatch Cards for our customers that are Single-Panel Cards, Window Cards, Waterfall Cards or a combination of these. We can easily customize Swatch Cards according to your needs by varying the number of samples per panel, size and overall presentation. Read more about the types of Swatch Cards we offer. Memo Samples are stand-alone fabric samples that are key to providing an aesthetic evaluation based upon the fabric type and pattern. Labeled Memo Samples are particularly effective for viewing a fabric with a large pattern while Memo Sets can showcase an entire fabric collection on a smaller scale. Memo Samples are often used by clients trying to make a final fabric choice but can also be used if you are launching a new product and/or need to add it to an existing sample set. We can customize the size of your Memo Sample as well as the information you include with it by adding a header or label. Learn more about our Memo Sample products. 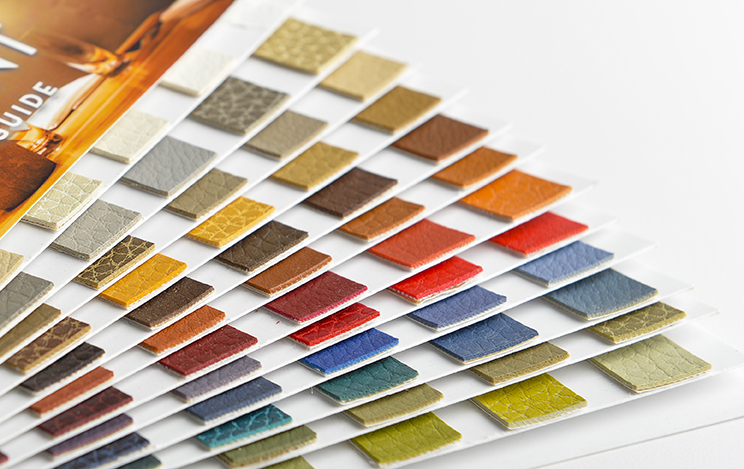 Swatch Sets are versatile book-like presentations of your textile where each sample has its own page or multiple samples can reside on the same page. Within the set, individual samples can include an optional header or printed information that provides more detail to the customer. Individual samples or collections are bundled together using rivets, chains or grommets to create the Swatch Set. Explore what we offer for Swatch Sets. This is our namesake product that started it all in 1968. Widths, patterns, and colors of your line can sometimes dictate the need for a permanently bound book of swatches to see and feel. The traditional Sample Book is an elegant and durable method to feature your merchandise. Sample books can be created in a variety of styles, shapes and sizes and customized through stack books, waterfall books, glued pages or binders. View our Sample Book options. Hanging Samples are typically used to present larger fabric samples and are commonly used in showrooms and retail environments. Fully customizable, hanging samples can feature an individual fabric sample in large format or several pieces can be bound together in waterfall or folded fashion. Printed information can be added to the header, as a part of the hanger, affixed to the back, or by adding informational inserts to the set. Learn more about our Hanging Samples.